Additionally, the list of professions that used to be the exclusive domain of human dexterity is dwindling and the ‘fantasized fiction’ of humans working with AI-enabled entities as ‘team members’ is rapidly becoming an inevitable ‘ground reality’ that is forcing a proactive rethink of HR policies/processes/procedures to accommodate the ‘new normal’ before it pervades the corporate landscape and the organizational leadership at ‘seemingly innovative’ corporate establishments is caught gasping for robust solutions to manage unforeseen and/or unrealized situations. 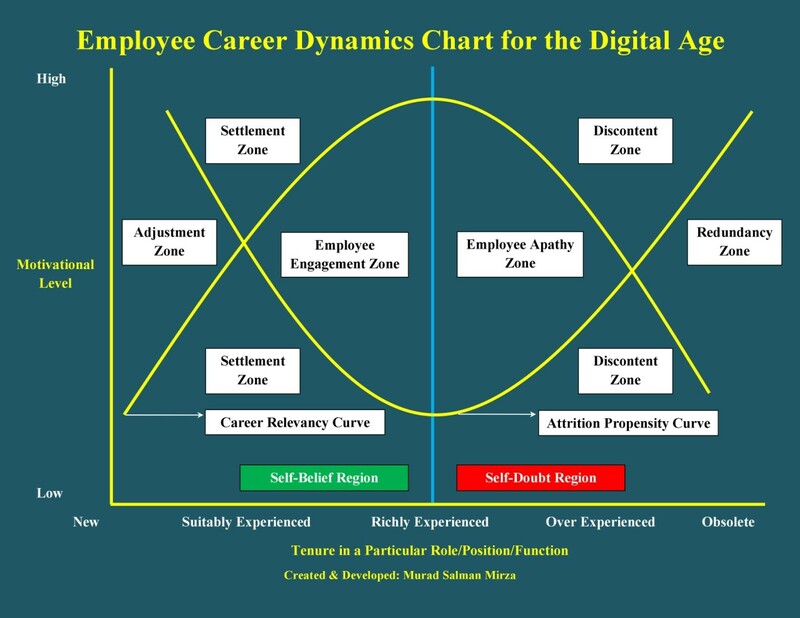 The aforementioned chart provides an insightful overview of how motivational levels play a significant part during the tenure of a professional in a particular role/function/position with respect to career relevancy and attrition propensity considerations. It is divided into two main regions, i.e., the Self-Belief Region and the Self-Doubt Region. The Self-Belief Region reflects the optimistic proclivity of a professional who is intrinsically motivated and perpetually driven to excel at his/her role/position/function as he/she prevails/succeeds in overcoming the associated challenges with infectious zeal. He/she is also the type of professional that the organizations like to project as their ‘brand ambassador’, especially, to entice the new crop of desired talent. The Self-Doubt Region reflects the pessimistic inclination of a professional who feels betrayed in terms of the ‘broken’ psychological contract, e.g., marginalized/overlooked for career advancement opportunities, victimized by organizational politics, ignored for high-profile assignments, etc., and is nagged by the urge to seek better career prospects with another ‘reliable’ organization while dreading the increasing probability of becoming ‘obsolete’ and being ‘pushed out’ as a ‘misfit’ by the current employer. This refers to the area where the professional is in the process of getting oriented to the new role/position/function. He/she is generally motivated and excited to embrace the relevant responsibilities and keenly observes how to initiate/develop productive relationships with his/her peers and supervisor(s). At the same time, he/she is also very sensitive to performance criticism and disparaging remarks/behavior from peers/supervisor(s) that can lead to his/her questioning the decision to serve in the respective role/position/function and may result in an early exit. Therefore, it is critical for the team, especially, the supervisor(s) to ensure that he/she is on-boarded effectively and given the confidence of being a valued team member in conjunction with the HR/Talent Management Function. This refers to the area where the professional starts to own the role/position/function after having a successful on-boarding experience and takes solid steps for establishing his/her own reputation as a worthwhile investment in the respective capacity. It also reflects the comfort level that seeps into the professional’s mindset as he/she sheds off any concern about being a ‘failure’ at performing his/her assigned tasks/responsibilities and gains appreciable amounts of intrinsic motivation to create a solid foundation for excellence. This also creates a buffer against any negative thoughts/experiences that may entice the respective professional to leave due to any expected impediments, e.g., organizational politics, peer jealousy, long work hours, etc. This refers to the area where the professional has attained an appreciable level of proficiency in his/her assigned role/position/function and is galvanized by an empowering corporate culture to go beyond the ‘call of duty’ to facilitate/assist/help anyone in his/her sphere of engagement, e.g., customers, clients, peers, supervisor(s), mentees, etc. Such professionals are the ‘true’ assets for the corporate entities and are often profiled/praised/heralded as worthy ambassadors in terms of being the embodiment of core values espoused by the organization. They are the hardest to poach by ravenous competitors and often consider extravagant recognition and associated financial rewards secondary to the attainment of personal gratification achieved from ‘selfless’ application of inherent talent nurtured by the ‘raw’ and ‘honest’ gratitude of recipients. This refers to the area where the professional realizes that his/her outstanding performance is not yielding career development and growth opportunities while his/her peers with considerably less capability are able to surge ahead with promising and high-visibility assignments due to favoritism/nepotism/other non-performance factors. Such a perception of blatant impropriety places the respective professional in a self-reflective mode where he/she assesses the fruitlessness of the value of his/her profound contributions/considerable achievements and steadily gains an indifferent attitude that often manifests in low morale, loss of drive, ‘going by the book’ work preference, mood fluctuations, etc. Consequently, the high motivation to do ‘great professional work’ at the present organization converts into the high motivation for finding ‘great career opportunity’ at another organization before the ‘margin of appropriateness/relevance/usefulness’, e.g., due to over experience, runs out in the chosen field. This refers to the area where the professional feels that he/she has no/minimal hope of advancing up the career ladder since most of his peers have either left or advanced to higher levels of the organizational hierarchy fairly/unfairly. Additionally, he/she may also start to get informal signals from his/her supervisor(s) and/or the HR/Talent Management Function about the slim prospects of his prolonged stay in the organization. Consequently, the motivation to leave the organization where he/she is not ‘valued’ increases substantially while often harboring a sense of ‘betrayal’ due to the ‘apparent’ lack of respect for serving a long time with the organization. This simmering bitterness coupled with the pulsating anxiety associated with finding suitable new employment converts such professionals into active billboards of organizational disharmony/malfunction while jeopardizing Employer Branding initiatives. This refers to the area where the professional has lost the interest and drive to contribute in any value-added way to the organization and is considered a burden, rather than, a worthwhile investment for the organization. Keeping him/her within the corporate ranks endangers the sanctity of a vibrant and cohesive corporate culture that binds the organizational fabric robustly. Consequently, the HR/Talent Management Function is often deputed by the Top/Senior Management to ensure the release of such professionals with minimal disturbance to organizational functioning, unless, they can leave on their own accord, e.g., upon finding suitable employment elsewhere. This is the least favorable option for progressive organizations that pride themselves on maintaining close contacts with their former employees, especially, in terms of leveraging their ‘employee experience’ to reinforce Employer Branding initiatives. Organizations are generally coded to value the performance of employees more than the employees themselves. Employees are generally inclined to value their career preservation more than the wider organizational imperatives. Consequently, while the corporate emphasis is on maximizing desired gains from employees as long as their marginal utility is deemed favorable; the priority of employees is to extract maximum individual concessions to justify continued allegiance to the organization.